MiG Construction is responsible for the health and safety of our employees, subcontractors, clients and the public while they are on our project sites. It is therefore MiG's company policy to abide by the Federal and State Occupational Safety and Health Administration's policies and procedures. All management and supervisory personnel are charged with the responsibility for planning and implementing safety on each project, no matter what size. Each phase of the construction process is addressed from preconstruction to close-out to prevent the occurrence of incidents and/or controlling conditions and actions that could lead to occupational injuries and illnesses. 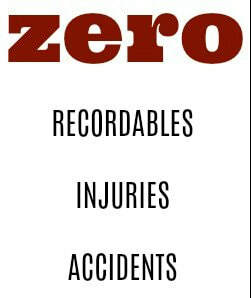 ​The ultimate success of our safety program depends on the cooperation of each individual employee. All Project Managers, Superintendents and Project Engineers have 30 hours of OSHA Training. Comply with the Client's policies and procedures. © COPYRIGHT 2017 MIG EAST LLC - ALL RIGHTS RESERVED.